On the 1st of August 2018, humans used up more resources than the Earth will produce in the entire year. As our Ecological Footprint grows, ‘Earth Overshoot Day’ is arriving earlier with every passing year. The delicate ecological balance is being disturbed, pushed our planet towards an unsustainable future. Do you know that every year, you end up spending more than you earn? In fact, on the 1st of August, humanity used up all its income for 2018. We are all now living on our stored away savings. This may seem ridiculous. After all, we scurry to balance our personal bank accounts. But what we take for granted is that the Earth itself is conducting a massive economic orchestra in trying to maintain its own stability and sustainability. We make this difficult. Human interference is threatening to push the planet to a dangerous precipice — an overshoot — from which it may never recover. Imagine a regular middle-class family. Every year, there is a steady (albeit fixed) income earned through salaries, interest on property etc. Every year, there is also kharcha (spending) on food, clothes, school fees, petrol and the like. And every year, if there hasn’t been too much spending, there will be some surplus, which will be promptly locked away in a cupboard or deposited in a bank for use in times of need. Ecologists view the biosphere similarly, in terms of ‘supply’ and ‘demand’. The Earth has resources budgeted regularly over three billion years. The Earth can be imagined to have a fixed steady income, called its biocapacity. This includes ‘assets’ like croplands, forests, fishing ground and grazing pastures, and ‘services’ like absorbing wastes and climate control. Life forms on earth ‘spend’ these resources. Humans, for example, consume food, fibre, livestock, fish, timber, fuel and countless other resources, while generating wastes – all adding to their ecological footprint or expenditure. Every year, excess resources are stored away in ecological reserves for later use. In fact, the pre-industrialised ecosystem of the planet has been so thrifty that it has built up an immense bank balance of rainforests, mines, oceanic reserves and species diversity over the years. Sadly, with rapid modernisation and industrialisation from the 20th century onwards, human beings have begun to ‘spend’ more than the Earth can supply. This means human ecological expenditure is exceeding the Earth’s biocapacity. Every year, we end up spending from the Earth’s reserve resources. 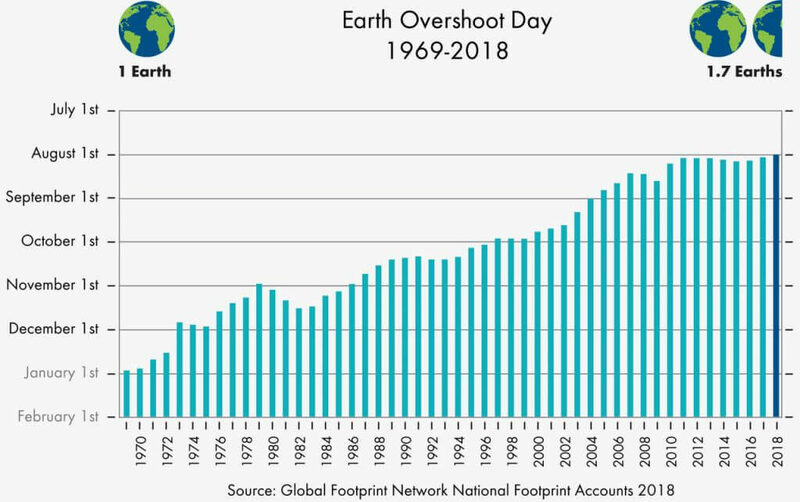 A loud alarm bell for the human race is “Earth Overshoot Day”, observed on the 1st of August for 2018. It marks the date when humanity has used up more from nature than it can replenish in the entire year. 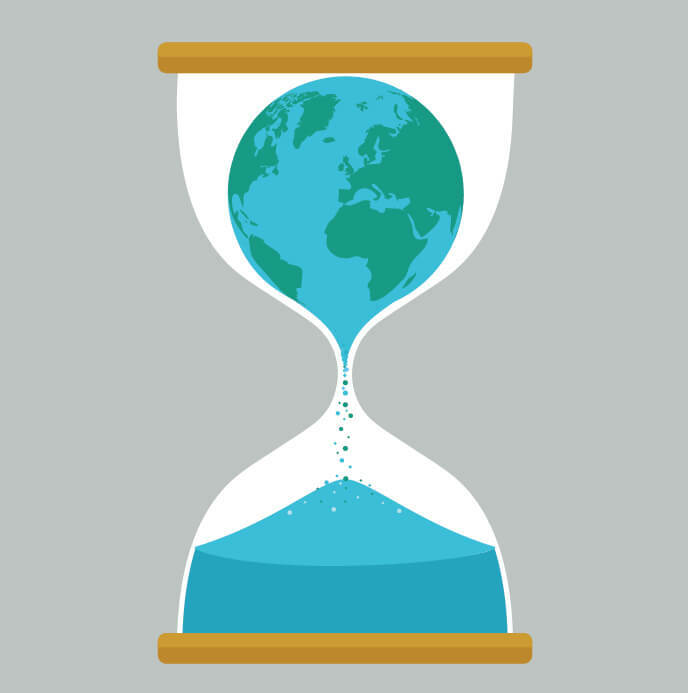 The remaining months are called ‘overshoot’, for when humans spend from the earth’s reserves. A troubling trend over the years shows that a day that used to fall in December has quickly moved to October, September and now August. More than 80% of the world’s population lives in countries running ecological deficits. 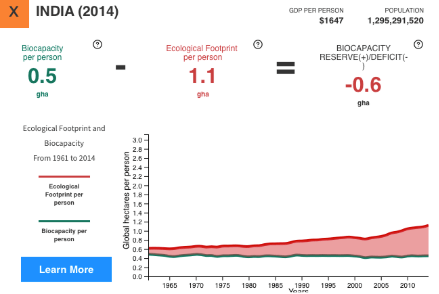 As per 2018 data from the Global Footprint Network, India has a Biocapacity per person = 0.5, and an Ecological Footprint per person = 1.1. That’s a deficit of 0.5 – 1.1 = -0.6, which is a very poor figure compared to other nations. India ranks third in the world after China and the US in terms of Ecological Footprint. There were no fireworks or street protests on the 1st of August, but Ecological Overshoot can have grave impacts on the human population. Take Delhi’s extreme air pollution, for example. A Berkeley Research Team suggested that breathing the air was equivalent to smoking 44 cigarettes a day. 11 of the 12 cities with the worst air quality in the world are in India, all with PM 2.5 levels over 100µg/m³ (the safe limit being 10µg/m³). 2015 saw 10.9 lakh deaths because of air pollution. Such occurrences are commonplace because the Earth’s forests and oceans are struggling to keep pace with human demands in sucking out pollutants. Similarly, natural disasters are on the rise. Global warming has interfered with monsoon winds, leading to many extreme rain events. When coupled with poor planning and lack of drainage, these unleash the floods. We saw such floods in Mumbai in 2005 and 2017 for instance, or recently in Kerala. Another classic repercussion of spending from our savings is overfishing. All fish species require time to mate, produce eggs and restore their populations. If harvested wisely, fish can sustain us forever. Forests, topsoil, species diversity all follow similar rules. Indiscriminate spending could risk pushing these resources below critical levels, from which they cannot recover. More worrying is the civil unrest that scarcity poses. If resources become scant, prices of essentials like food, clean water and electricity will soar, increasing instances of conflict. We currently use about 1.7 times what the earth can offer us. By 2030, we would need a second globe to satisfy human demands. Most of us will probably have an ecological footprint much higher than 1.7, which means that we have a far greater responsibility to cut down on our consumption. Policy makers in government and business houses also need to begin to focus their attention on this phenomenon of overshooting. The Paris Climate Accord 2015 aims to “hold the increase in the global average temperature to well below 2 °C above pre-industrial levels”. This would require greenhouse gas levels (currently at 492ppm) to be kept below 450ppm. 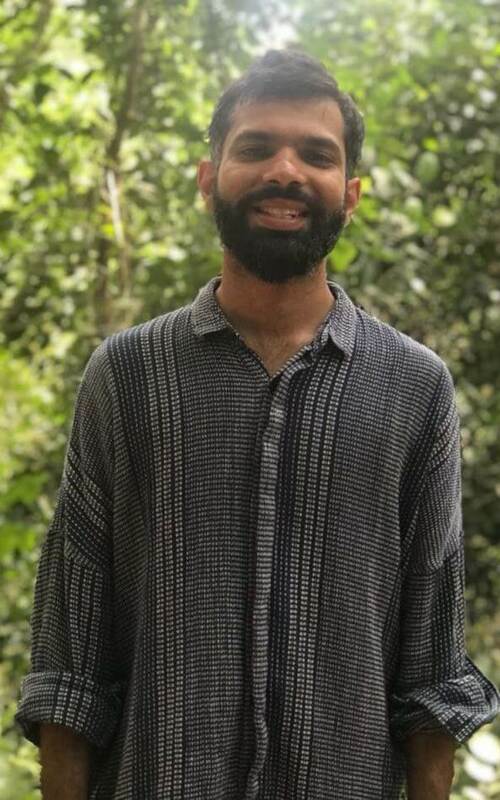 Meeting this aim will demand a comprehensive action by all world governments by investment in cleaner renewable energy infrastructure, setting emission limits for corporate houses, planning of sustainable, compact, efficient urban spaces and curbing population growth via better education and healthcare. At every level, perhaps, from the state to the individual, we need to start treating our environment as we do our bank balances in order to establish a sustainable future for generations to come.